Bath & Body Works Coupons & Sales! 3 Wick Candles $9.75! The Best Bath & Body Works® Coupons and Sales! Save with these Printable In-Store Bath & Body Works Coupons and Online Coupon Codes for Lotions, Candles, Hand Soaps, Wallflowers, and More! Who doesn’t love Bath & Body Works®?! 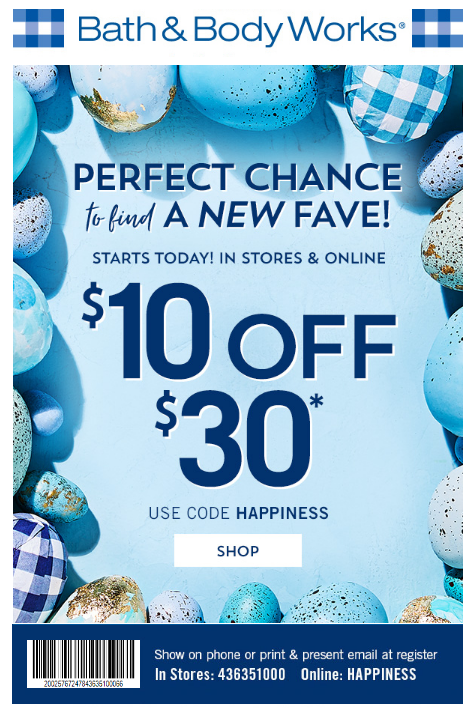 They have great skin care and candles, and if you are looking to save, I have all of the best Bath & Body Works® Coupons and Sales right here with the latest cheap deals! Here’s an awesome freebie for all of you who love to shop for your 3 Wick Candles at Bath & Body Works. Today through 4/20, you can get $10 off $30 Purchases with the code HAPPINESS, plus they have Buy 2, Get 2 Free 3 Wick Candles! Use this coupon in stores. If you buy 4 candles with the coupon in stores, you will pay just $9.75 per candle! Hurry and get the 3 Wick Candles at Bath & Body Works now because this is only going on for a few days! Bath & Body Works® is a trademark of Bath & Body Works Direct, Inc.